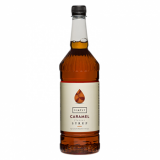 Monin Caramel syrup in small stylish 25cl glass bottle. Caramel simply means caramelised sugar, traditionally obtained by melting sugar in a sauce pot of water. The rich flavour and colour of caramel derive from the process of heating and melting the sugar. 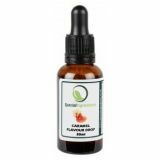 Caramel is appreciated as the main flavour and is also used in harmony with other flavours. With versatile Monin Caramel, endless applications are possible! Caramel flavour is used in speciality coffee beverages, cocktails, desserts, and culinary applications. Taste:Ppowerful, deep smell and very specific burnt caramel flavour; sweet candies taste, after-taste of caramelised sugar. Applications: Coffees, milkshakes, dessert drinks. Sugar, water, flavouring, acidifying agent: citric acid, colouring agent: Caramel E150a.